Brrr! Jack Frost pounced on my garden the other night. Buh-bye fragile zinnias and morning glories. Hello, enduring green things and dazzling fall foliage! SWOOSH! We’re standing behind the house now, with a view of the boxwood garden. 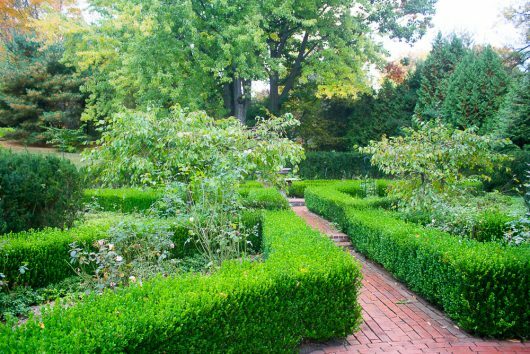 In addition to the boxwood, please note the pair of dwarf, weeping crab-apple trees. At the north end of the boxwood garden is an ancient, silver-leaved maple tree, with pachysandra at its feet. I recently filled the bed with dozens of daffodils for a spectacular April show. 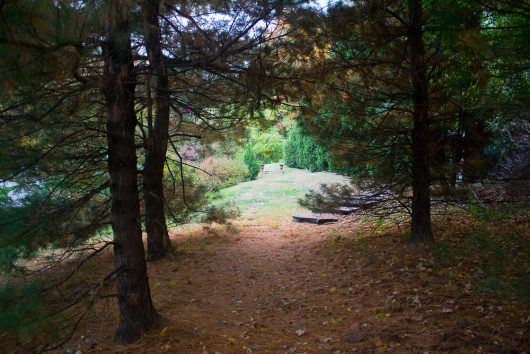 Continuing northward, we encounter a bluestone path that leads up the hill to a trio of white pines. Sally forth, my friend. Looking west, through the white pines. 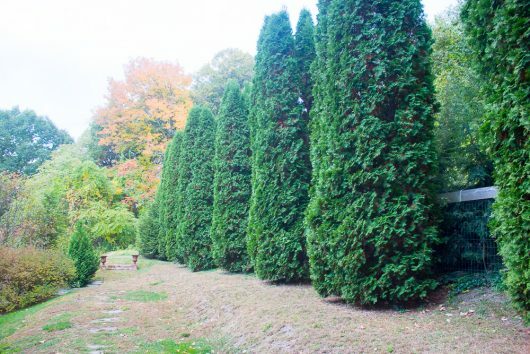 Beyond the pines, to our right, is a long row of arborvitae. These provide welcome shelter for wintering birds. To our left is the top terrace of the Serpentine Garden. 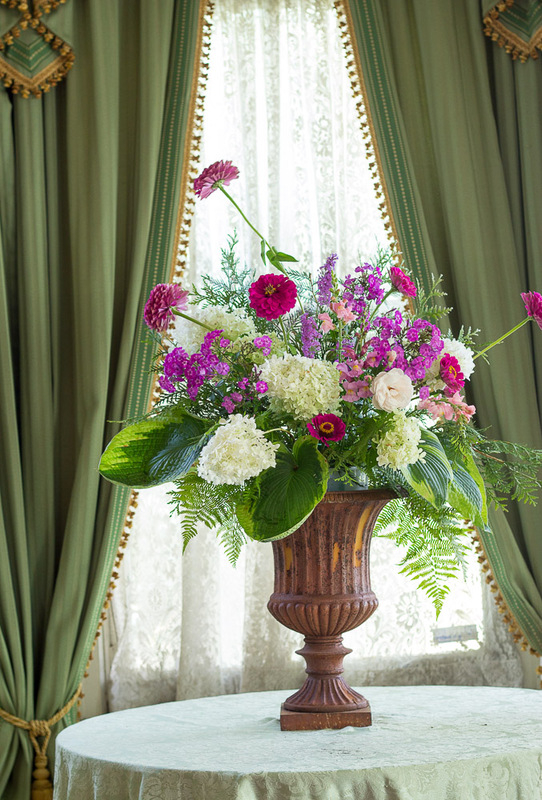 We won’t visit that garden today, but you can see it in all its springtime glory by clicking this link. 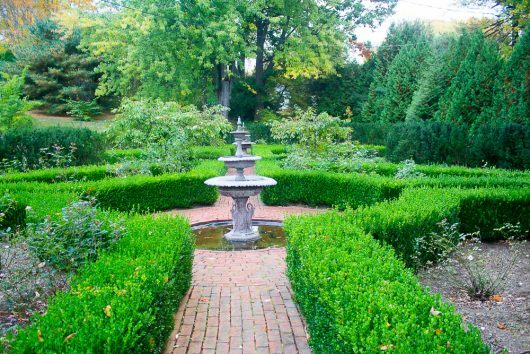 At the end of the arborvitae hedge is the kitchen garden. Shall we step inside? Our view from the kitchen garden’s front gate. 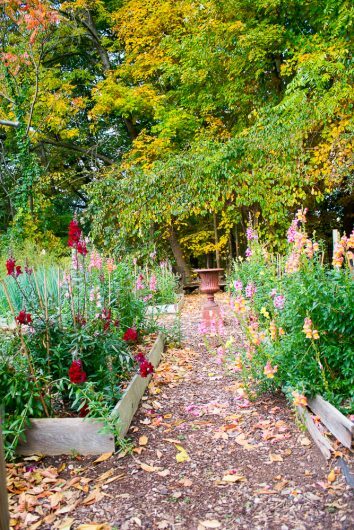 The central path is flanked by narrow beds of snap dragons. What troopers these plants are — they merely yawned at our recent frost. The snapdragons are members of the tall ‘Rocket’ series. I have them in yellow, lavender, bi-colored, and burgundy. This last variety is pictured above. 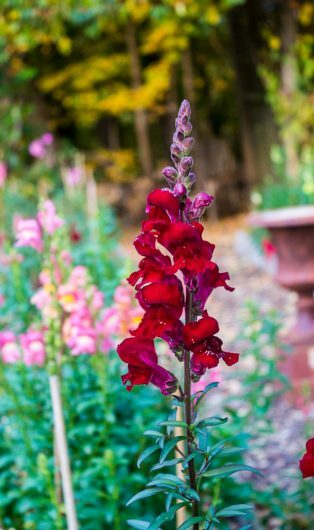 Did you know that snapdragons make reliable, long-lasting cut flowers? I like to poke them into early-autumn arrangements for my entrance hall table. Click here for more details and pictures. I’ll bet this bed looks empty to you. We’ll find potatoes! 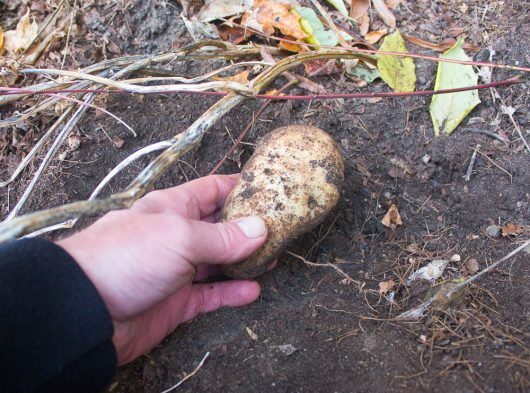 Actually, I planted 3 beds of potatoes last spring. And now that my cellar is cool enough to accommodate them, I can harvest the spuds. Opposite the kitchen garden is the pool garden. 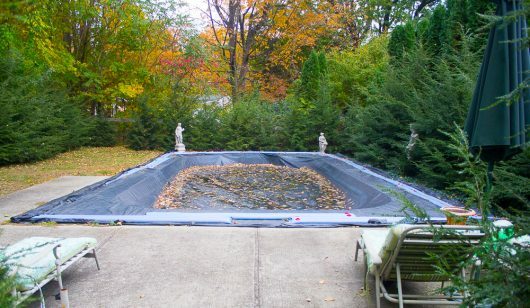 To the disappointment of the statuary here, the pool was closed last week. Oh, to have an indoor pool, just as you do. Behind the pool and kitchen gardens is the Woodland Garden. Shall we pass beneath the arch in order to see it? The woodland is currently wearing a blanket of leaves. In time I’ll shred these fallings with the nifty leaf-shredding gadget I described in this post. Shredded leaves are nature’s mulch. 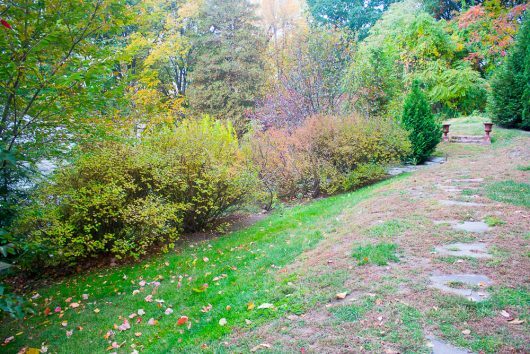 At the north end of the woodland garden, defoliated trees permit a view of a Hudson River tributary. In winter, the tributary makes an inviting home for ducks and geese. They quack and squawk contentedly no matter how cold the weather. And speaking of cold weather, there’s a sudden chill in the air. Shall we head back to the house? Here’s a rear-view of Clover Hill’s many rooftops. 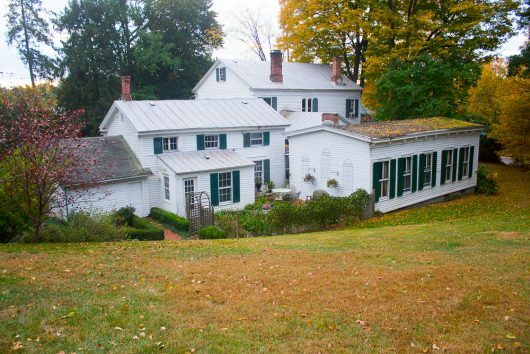 The property’s original structure (near left) was built in 1794. 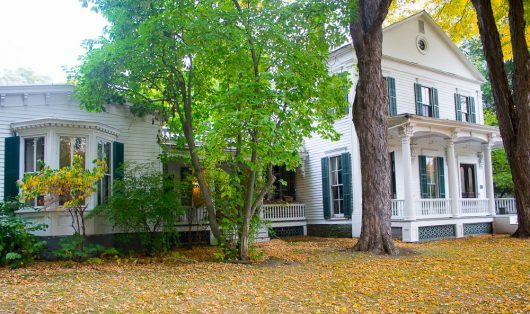 The rest of the house was constructed between 1826 and 1870. I designed a small herb garden in the “L”-shaped nook behind the north and west wings of the house. We can visit that garden some other time. 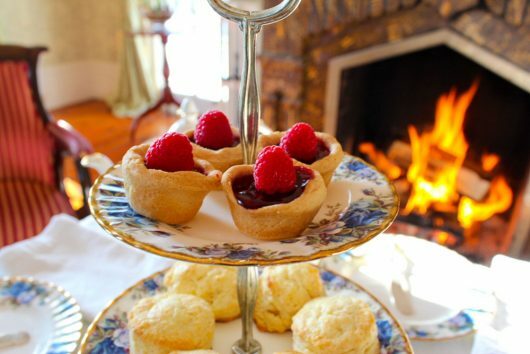 Meanwhile, let’s tuck into some Afternoon Tea in the parlor. Then you can tell me all about your own autumn garden. 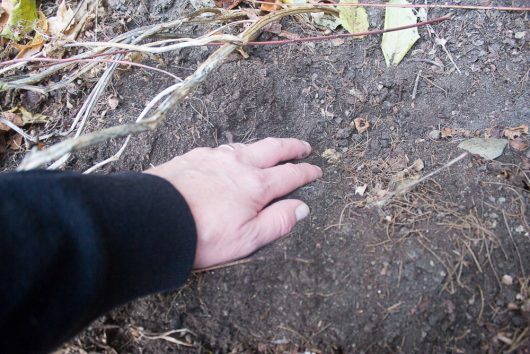 Have you harvested all of your crops — or did the critters get ’em first? I’m all ears, baby. 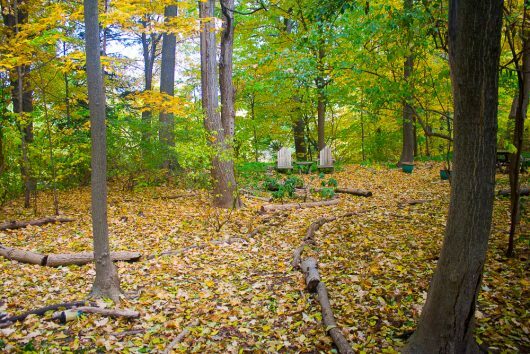 Kevin, I love your fall garden, but I hope you just “leave the leaves” in the woodland beds for the forest critters–even some future butterflies that may have already found a safe haven there. Then make compost with the rest of the leaves with your shredder — I have the same one and love it! So… I’m just gonna live in your yard! Thank you for the wonderful tour.Your property is beautiful, a great place to take along walk in the fall, and year round I am sure. Living in the city that is what I miss most. Thank you again for sharing. Thank you for the tour, it is always inspiring to see your gardens. I live in Fond du Lac WI, just outside the city, so I get lower temps and more wind than in town. we had two nights of frost, but I had very little damage because of all the massive trees, still sheltering them. I have 7 antique oaks, waaaaay more black walnut trees than I want, blue spruce, a river birch, an apple and a pear tree and an enormous willow. that is on 1.25 acres. I don’t have much sun. I have 3 large raised beds with a seating area where I grow salad! tomatoes, peppers, chives, hyssop, thyme, borage, sage, basil, a variety of mints, morning glories, hosta and begonias. And I love your recipes. So enjoyed touring your gardens on Conservancy day in June. Thanks for this autumn view! Have all your froggies found their winter spot? I bet you’re fun to live with. I’m on the other side of the state from you and we have yet to have our first frost. Tomorrow my daughter and I will be cleaning the garden up some more. I kind of went overboard with the pie pumpkins this year ( first time growing them) so the next few nights will be spent roasting pumpkin to make puree for pies and such. Today we snatched up the last of the butternut squash and in the process found a few petunia plants that I could take cuttings from. Thank you for the idea and directions for that!!! I also made a mental note to plant the nasturtiums some place else next year. I do have to ask though if you don’t mind, how much property do you and the Silver Fox own? So many pretty gardens!! You can never have too many gardens or flowers! Still need to rake leaves but not yet because there are still quite a few left on the trees. A cup of tea sounds wonderful! Have you tried growing garlic? Might be too late this year to try since you’ve had a frost. 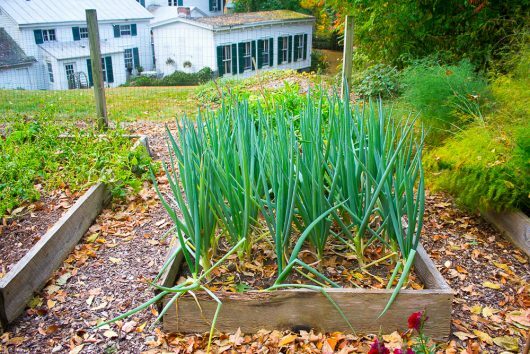 I’m going to put a few cloves in one of my raised beds and see what happens. 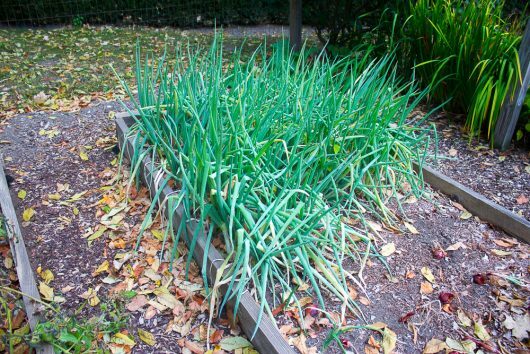 This is for Jan: I don’t mean to speak for Kevin, but I think he plants garlic every year. His tutorial was very helpful to me. Here it is: How to Plant, Grow, Harvest, and Store Garlic. I have daffodils in my Pachysandra patch, too. What a lovely, sylvan stroll. Thanks for inviting us into your personal spaces. Except for tat soi, leeks and parsley, I finished harvesting today. Still want to cut down all the chives to make your addictive chive pesto. All tender crops were brought in last week just before the first frost. Surprisingly, despite other varieties of morning glories succumbing to that chilly event, the Heavenly Blues were untouched and are blooming their beautiful heads off. Have been filling all the beds with masses of finished compost started last fall, and am starting to build this year’s huge pile. My horse owner friend delivered around a ton of equine gold just in time to layer it with shredded leaves and garden waste. Have over 300 host as to cut down, along with just as much other plant debris. My ancient body is loudly voicing its displeasure with my annual hyperactivity, but tough. It will have plenty of time to recover through the winter, which is predicted to be more bitterly cold than usual. Whoopee! Not. Kevin, great to “visit” with you again! Always enjoy tours of the property, your suggestions and recipes. 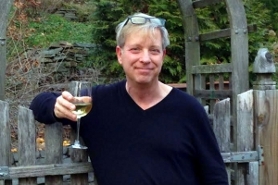 Hopefully our fall weather sticks in NJ moving forward- love this time of year! You chose a perfect day to “shoot” your garden – the lighting is stunning. Thanks for sharing these lovely photos with us. Starting off my Sunday morning with a walk with you is always a treat! Your walk with delightful humor and knowledge is so beautiful. Happily I found 3 Thomas Edison Dahlias and a couple of honeysuckle flowers yesterday for vases. And I have hydrangeas in lovely shades of pink. 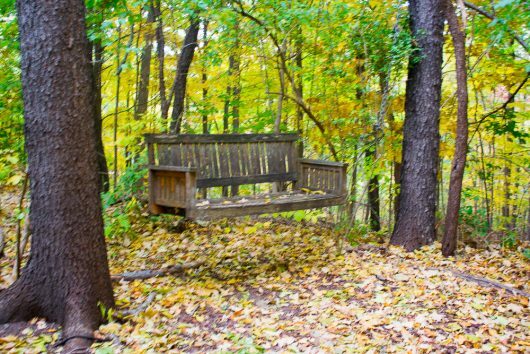 With trees turning colors our leaf mulch soon will happen. That was a nice tour of your yard. If I lived there, I would never want to leave. 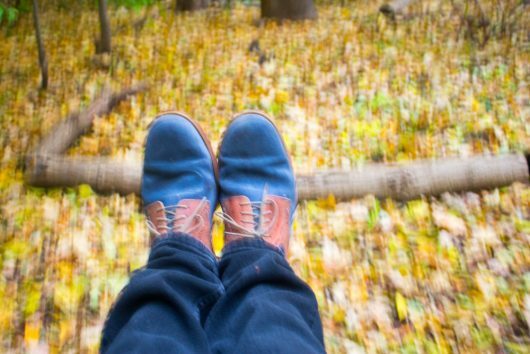 Love your shoes = ) My garden is almost done for the year. Yesterday I went out and picked one last bowl full of cherry tomatoes. There are only a few more left now. And it looks like the colder night temps have gotten to my potted plants. Still enjoying the few last roses on two of my rose plants and have been making very small bouquets with what is left. It will be time to get out the rake soon. Happy Fall everyone. Kevin, any ideas for dealing with groundhogs? For the past few years my vegetables have been mostly groundhog food! 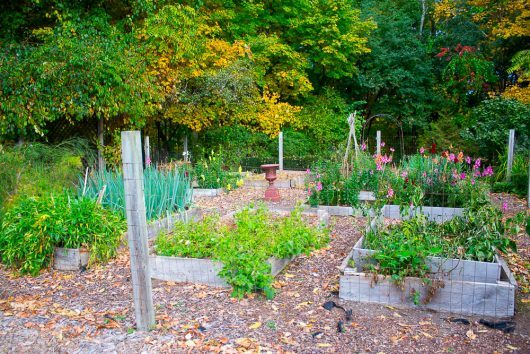 I don’t want to put out poison as I actually do enjoy wildlife and have no desire to kill anything, but I really would love to have some of the vegetables for the house. 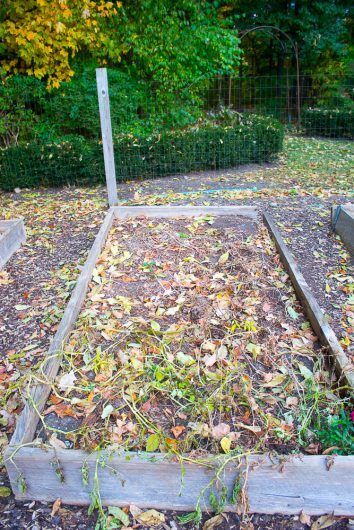 I agree that we should leave the leaves in our beds, along with the dead heads and stalks, so the butterflies and other insects have a place to overwinter. If you just push aside some leaves on the ground you are sure to find some critters that are hunkering down for the winter. If we remove those leaves – even to shred them for mulch – we are disturbing them. Wait until spring and then go to town! I’m picturing your snapdragons yawning at the frost. ha! Love that! of room, are they worth it – taste-wise – over buying them at the grocery? Stunned by your beautiful property! I love seeing the changes in your gardens. Here on LI my snapdragons are blooming still and my verbena and calendula sing in sunny areas. Nasturtiums blooming profusely yet the Okra is about done; it’s a handsome plant with lovely flowers and I grow it to use in soups and crafts. An okra pod sliced horizontally makes a wonderful rosette pattern for printing fabric and paper. The string beans are still producing. I got a little crazed at the nursery last week and bought 600 bulbs (a LITTLE crazed?!) of various kinds to add to the bulbs to add to the daffodils and tulips already in the long stretch (110 ft.) that fronts the house up at the street. It’s killing me now, but in the spring it should look splendid! And my pineapple sage continues to delight and work wonders – panicles of red fireworks that last into November. I love your gardens. What an inspiration to get busy at my own little garden and yard. Kevin, from whom did you purchase your snapdragon seeds? I haven’t been able to obtain the Rocket variety locally, and I’m sure you have a good mail-order source. Thanks! And thanks for the beautiful tour! Happy Autumn. Lovely! Wish my yard and garden looked so nice. Gnats were horrible here all summer and made it nearly impossible to work outdoors. Now that it’s cooler, I hope they will be gone. Cleanup is my plan for the next week or two. Such a beautiful piece of property, Kevin. I love seeing the colored leaves in your photos and as I walk my dog in my neighborhood here in Michigan. I want to pick up all the different hues of them and save them. But then they wouldn’t be as beautiful as when they are on the ground. I used to love Fall the most of all the Seasons, but now I am mourning summer. I just didn’t get to do all the gardening I wanted to do and I dread the cold of Winter. But, really, all that mourning and dreading are useless, I know. I’ll try to straighten up my attitude in another week! Have a lovely rest of Fall, Halloween, and Thanksgiving! Thanks for sharing your pics of your beautiful gardens. They must be even more spectacular in person! 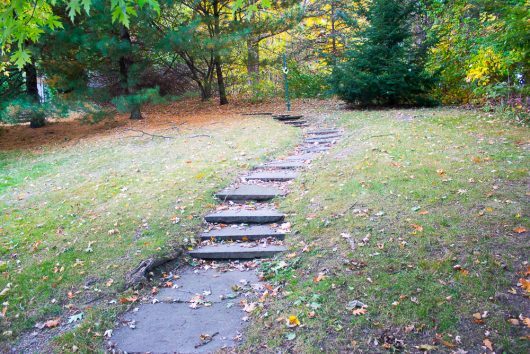 Love the pictures of your grounds and beautiful home. 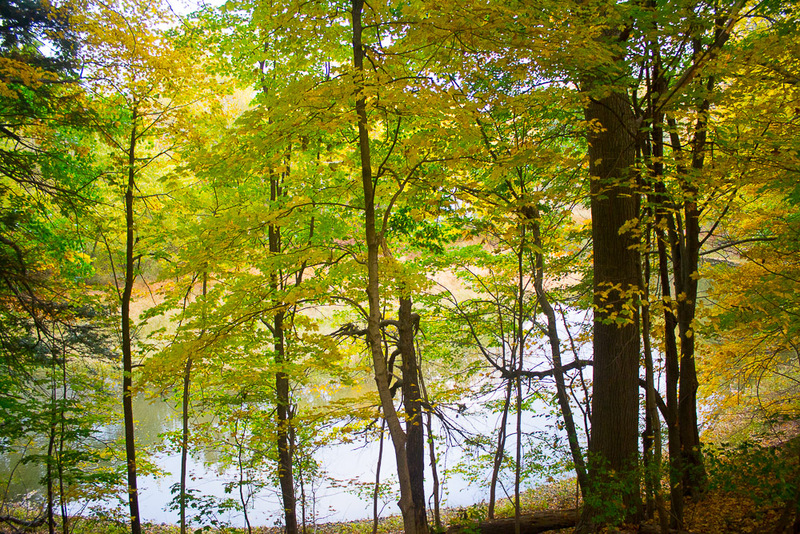 I especially like the view through the trees of the river. It must be so nice to watch the birds and ducks all Winter long! I trimmed down the asparagus ferny tops last week. The tomatoes are finally done (bonus of hot weather this fall in NE Ohio). I picked the few stragglers of green pepper, Poblano pepper, and jalapeno peppers yesterday. I picked broccoli 2 days ago and upon examination found that I was sharing it with several small green worms. Do they come from the white moths? I have brussell sprouts awaiting the first hard frost and then I think I am done til spring. I wish I had some ready-made tarts to share with my neighbors though. Thank you for the tour! Beautiful. I remember that pumpkin bread from last year and it is a winner. Yummy. Thanks. 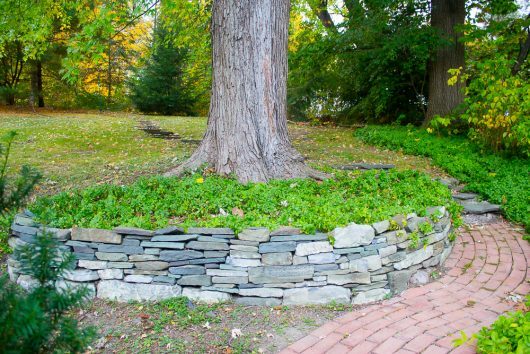 I so love your gardens, and I have become addicted to your emails! 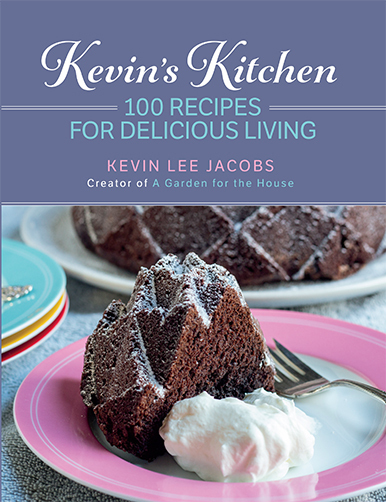 I always find myself waiting anxiously for more Kevin’s recipes, tips and photos. My little garden is now all ready for winter. I live in Ottawa, so the cold is already here to stay. I planted tulips, crocuses and hyacinths bulbs in an area, and followed your instructions religiously to avoid critters. So far, it’s working! I’m also all done with the leaves shredding, and this weekend I’ll be putting it in all beds. I want the relatives of all those good, happy, fat worms you have in your garden to come and live here. I’m no good at blogging, but I read a lot of them and your walk through the garden posts are my favorite! I love your blog in general- but something about the mini-escape from my desk just hits home every time 🙂 Plus, I’m PNWer now living in Southern NM- I needed a fall-fix! I can only grow what critters don’t want to eat, which leaves me a raised bed of asparagus, now properly mulched with shredded fallen leaves, and garlic and onions also in raised beds. Nothing else is left to harvest, except for woodland mushrooms. I was out yesterday afternoon and “harvested” eight pounds of grifola frondosa, aka Hen of the Woods or Maitake, a choice edible mushroom, with purported medicinal value as well. All I can say is if you visit the bulk section of a store like Whole Foods Market, you will see how much they cost (dried, or fresh) and think of all the delightful recipes I’ll be able to make, simply by using some of them fresh and the rest properly put up for use over the winter ahead. 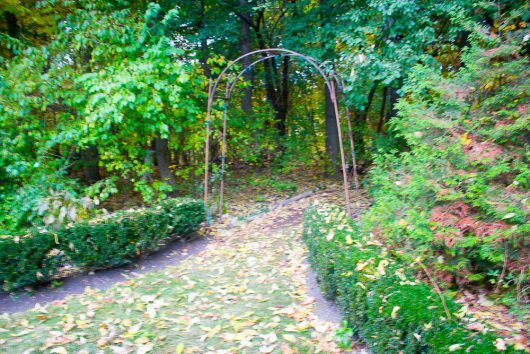 How gorgeous your gardens look, even in the Fall. My friend and I visited in the summertime and I thought nothing could top that beauty but I must tell you that even without blooming flowers, it looks fantastic! !